A more traditional shot from ECVB abandoned powerplant in Belgium, in that it is large-scale, features a turbine and looks properly ‘industrial’. The turbine hall was massive and difficult to photograph in a way that did justice to the scale of the place, and I did take a couple of panoramas with my 16mm fish eye lens but these didn’t really stitch together very well and I wasn’t happy with them. This one was shot with my 14-24mm f2.8 and combines two different exposures (for inside and the view through the windows), uses two separate textures selectively masked out, and a brightness/contrast adjustment layer. More to come from ECVB over the next few days. This entry was posted on Wednesday, October 12th, 2011 at 22:07. 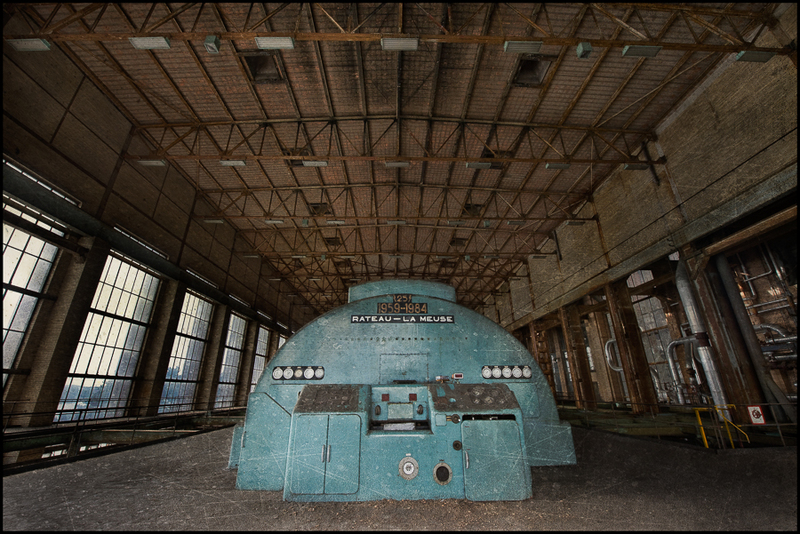 It is filed under Industrial, Urban Exploration and tagged with abandoned, Belgium, Digital Image Manipulation, ECVB, Europe, Fine Art, powerstation, Textures, UE, Urban Exploration, UrbEx. You can follow any responses to this entry through the RSS 2.0 feed. Very good – caught inside and outside very nicely, well exposed all round.